True to form, if I put Japanese and Sushi on the roster, my turnout tends to be smallish. I thought it might help the situation if I selected a sushi joint that is Portland’s most talked sushi outpost, but it turns out a few of my regulars don’t care for the place. Anyway, I was glad I managed six for my recent dinner at Bamboo Sushi, but Restaurant’s Roulette’s Sushi Curse continues (Sushi #1, a disaster, slow service, rice shortage, not enough food to go around; Sushi #2, canceled due to lack of interest; Sushi #3, a moderate success, but smaller crowd than usual; Sushi #4, good restaurant, only moderate interest.) Anyway, I guess if I ever want a big turnout for a sushi dinner I need to have it at that kooky, overflowing little place in Sellwood where you get gigantic, modest quality rolls. 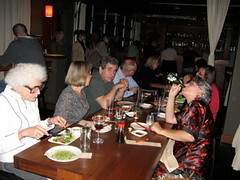 Yoko’s is still my favorite, but it’s hardly the place for a group dinner. Portland may not be a trendy sushi mecca like LA, but we do have Bamboo Sushi, the only sustainable sushi restaurant in the United States, if not the world (Marine Stewardship Council Certified.) Bamboo Sushi serves only items that can be harvested from species with healthy populations or farmed in an environmentally conscious way. In the beginning, the space that houses Bamboo on NE 28th (next to Ken’s) was an Eastside outpost of another sushi place, and I had lunch there once, and it was really fancy. Then Kristofor Lofgren, who I believe was associated with Masu East (the aforementioned restaurant) decided he would take over the spot himself, and go in another direction, a much harder direction. In fancy sushi cities, they ofter gravitate toward certain species of fish that are trendy and unusual to eat, not caring what their harvesting is doing to the species themselves or the oceans that support them. Mr. Lofgren, on the other hand, decided he would open a sushi restaurant based on his own sensibilities, those being that you have respect for the sea and don’t market seafood that is over harvested or environmentally damaging to harvest. Although he wanted to open a popular restaurant, he insisted on putting the ocean before the eater, knowing there are plenty of abundant, fresh, tasty fish out there that you can create magnificent seafood meals from. Many people believed that Bamboo Sushi wouldn’t be able to make much of a go of it, but over the last 3-4 years it’s been packed, so much of a success that they decided to open a second location recently in NW Portland. Although I love it, I’ve never had too much luck co-mingling Japanese food (and especially sushi) and Restaurant Roulette. I see people in our group eat raw fish all the time, but then when sushi comes around, forget it. Do people even try sushi (especially rolls) before they reject it out of hand? 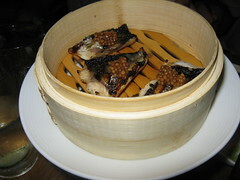 Most of the time it’s just vegetables, rice, seaweed and fish, and often the fish is smoked or otherwise cooked. 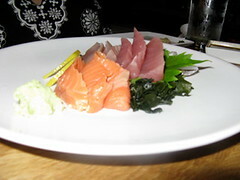 Okay, it’s true raw fish isn’t supposed to be ultra healthy for you, as you can never be totally sure what’s lurking, but if you can eat an entire plate of hamachi, or a bowl of ceviche, or an entire meal consisting of a raw tuna starter and basically a raw tuna main course (yes Glenda, fingers are being pointed in your direction) why isn’t the tiny portion of raw fish in a tuna roll okay compared to 20 times as much seared Ahi? Let’s face it, there seems to be some sort of brain block when it comes to sushi.